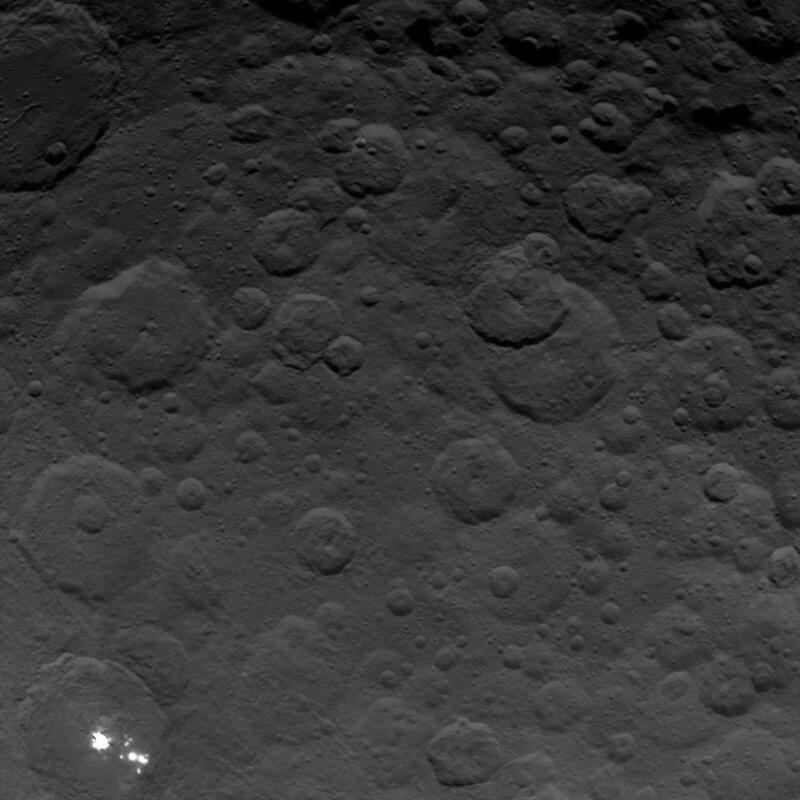 July 27, 2015 – A new image taken by NASA’s Dawn spacecraft, shows the brightest spots on dwarf planet Ceres from an altitude of 2,700 miles (4,400 kilometers). The image, with a resolution of 1,400 feet (410 meters) per pixel, was taken on June 24, 2015. NASA’s Dawn spacecraft is currently in the midst of a spiral descent which will take it to its third mapping orbit at Ceres. Using its ion propulsion system, Dawn will maneuver to an altitude of about 900 miles (less than 1,500 kilometers) above the dwarf planet. Dawn will arrive at its next mapping orbit, called the High-Altitude Mapping Orbit (HAMO), in August. Once there, Dawn will begin taking images and other data at unprecedented resolution. The mysterious bright spots on Ceres have continued to puzzle scientists. At least eight spots can be seen next to the largest bright area, which scientists think is approximately 6 miles (9 kilometers) wide. A highly reflective material is responsible for these spots — ice and salt are leading possibilities, but scientists are considering other options, too. Dawn’s mission is managed by JPL for NASA’s Science Mission Directorate in Washington. Dawn is a project of the directorate’s Discovery Program, managed by NASA’s Marshall Space Flight Center in Huntsville, Alabama. UCLA is responsible for overall Dawn mission science. Orbital ATK, Inc., in Dulles, Virginia, designed and built the spacecraft. The German Aerospace Center, the Max Planck Institute for Solar System Research, the Italian Space Agency and the Italian National Astrophysical Institute are international partners on the mission team.